The new University of Rhode Island Magazine brings you a variety of ideas, voices, and images, reflecting the diversity of our community. After 25 years, QuadAngles has been transformed into the University of Rhode Island Magazine. Why a new look and feel for the magazine? In readership surveys last year, you told us you’d like more features, more photos, and more University-focused stories. You wanted alumni, faculty, and students to speak to you through these pages. I know you’ll enjoy exploring this inaugural issue. New sections in the magazine feature those voices of faculty, students, and alumni you asked for. In Why I Teach, Bryan Dewsbury explains the intervention system he uses in his first-year biology classes. In Annotations, Kyla Duffy ’18 shares her insights and photos in a piece about why film photography is relevant in a digital world. In Ask Our Big Thinkers, pharmacy professor David Rowley and Kingian nonviolence trainer Thupten Tendhar share expertise you can use now. Our features uncover some true URI treasures, like Duval Clear ’88, aka Masta Ace, an icon in the hip-hop industry. 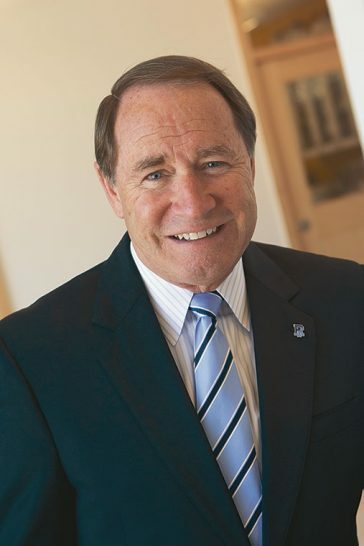 These pages reflect the ever-increasing diversity of Rhody Rams from every generation. 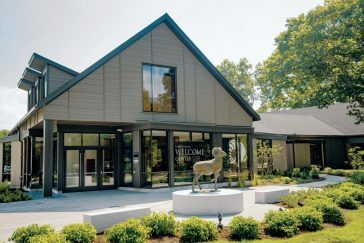 The statue in front of the new Robert J. Higgins Welcome Center was a gift from Joan Libutti and Dan Libutti ’63. The bronze sculpture by artist David Spellerberg was given in honor of Daniel Libutti ’25 and dedicated to all generations of Rhody Rams. 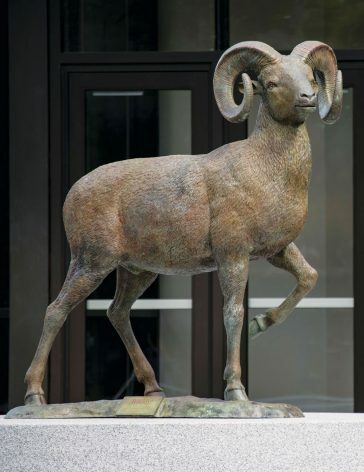 Speaking of Rams, our new Robert J. Higgins Welcome Center pays tribute to our mascot with a new statue (left). It opened in time to greet the class of 2022, culled from a record 22,786 applications. Forty-four states, plus Washington, D.C., Puerto Rico, and 49 nations are represented in the class, which can choose from several new majors, including international studies and diplomacy, and innovation and entrepreneurship. These align with the University’s vision to build an international community of scholars in our small corner of Rhode Island. The globalization of URI we imagined a decade ago is a reality today. The new Robert J. Higgins Welcome Center offers a head-turning first impression of URI. The growth of our international programs and cultural competence is not the only evidence of tremendous change at URI. In the last 12 years, nearly $900 million has been invested in renovating or constructing about 1 million square feet of building space on campus. I am delighted to report that in June the General Assembly approved a $12 million initial phase of improvements at the Fine Arts Center, so that we can begin needed improvements to our performance spaces and to the building’s mechanical systems, roofing, and other structural elements. What else is in store for the class of 2022, most of whom were born after the millennium? It was fitting for these students, savvy consumers of technology, to help us usher in a new series of events and programs: URI Innovation with Impact 2018. Showcasing the creative and boundary-pushing work of students, faculty, staff, alumni, and industry partners, the series launched our new academic year with 14 days of events, including the opening of an Artificial Intelligence Lab in the Robert L. Carothers Library and Learning Commons. Just as we thought big about how we could become a global institution of higher learning, so too are we envisioning ways to stay ahead of the next technological breakthrough. I have every confidence the class of 2022 will lead the way. I can’t wait to learn what they have to teach us.